What’s the UNIQUE value prop for this product? How do I beat my competitors with this product? What applications or industries are most likely to buy the fastest? 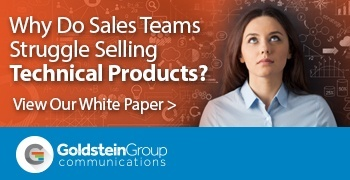 In our newest White Paper we cover these questions and more that you need to ask to get your Sales Pillar in shape. Answers to these questions will form a powerful selling tool to kick off any sales initiative and Sales Guide that will shorten their learning curve. Click below to get the checklist!